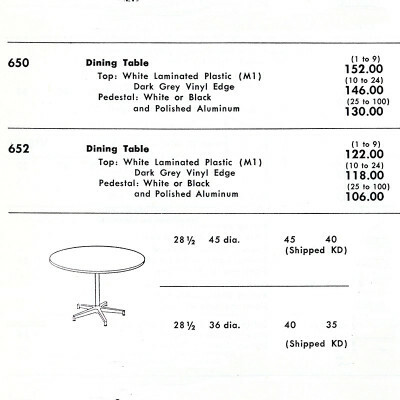 What was the Model 650 Table Series? 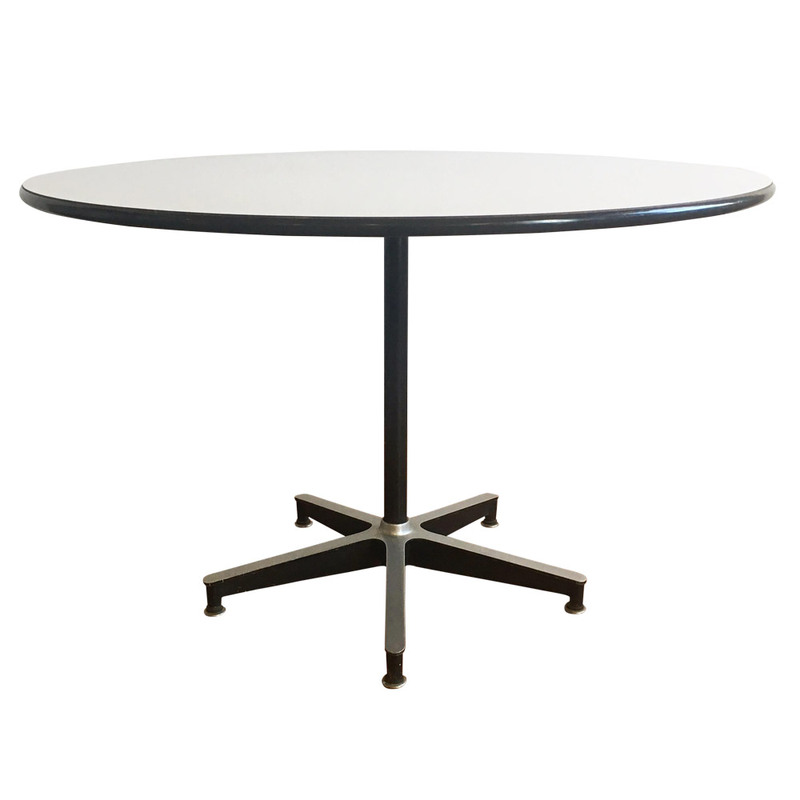 Released in 1956, the Eames Model 650 Dining Table had a very distinctive design with its pedestal column and spider like aluminum base. The range was made available in two sizes, either 45" (model 650) or 36" (model 652), as well as two colors of base (black or white), the tops however were only available in white plastic. 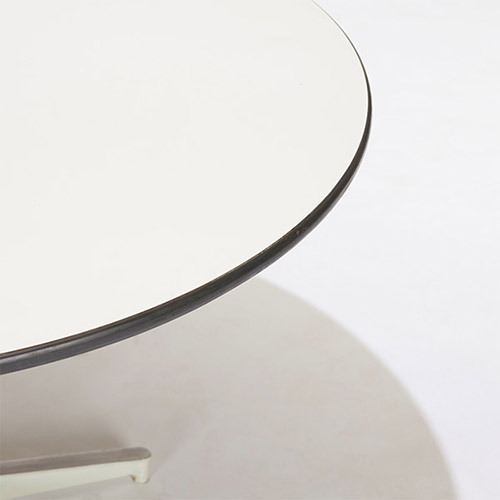 The 650 range of tables were the first to be released to the market that were not made from the molded plywood developed for furniture post war in the Eames Office. Newly available materials meant that this new look design benefited from lightweight Aluminum as a base for the first time along with a plastic top and vinyl edging. Note how the base matched that of the Eames Lounge Chair and Stephens Trusonic speaker released in the same year. The range was very much a transitional design and it was a precursor to the Aluminum group and its contract base that would be released two years after in 1958. The success and versatility of the Alu Group would ultimately see the 650 range phased out by 1960. The Eames Model 650 Dining Table was a popular choice, especially when bought alongside a grouping of fiberglass side or arm chairs. 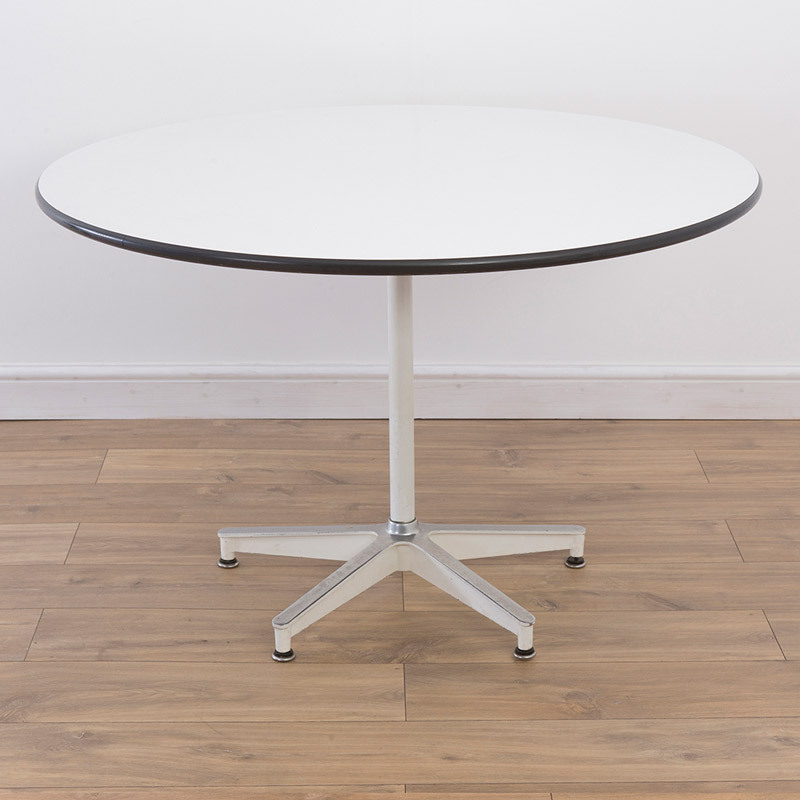 Its short lifespan means that relatively few of them reach the secondary market today and they are certainly not as well known as the contract and subsequent Universal Base tables that superseded them. 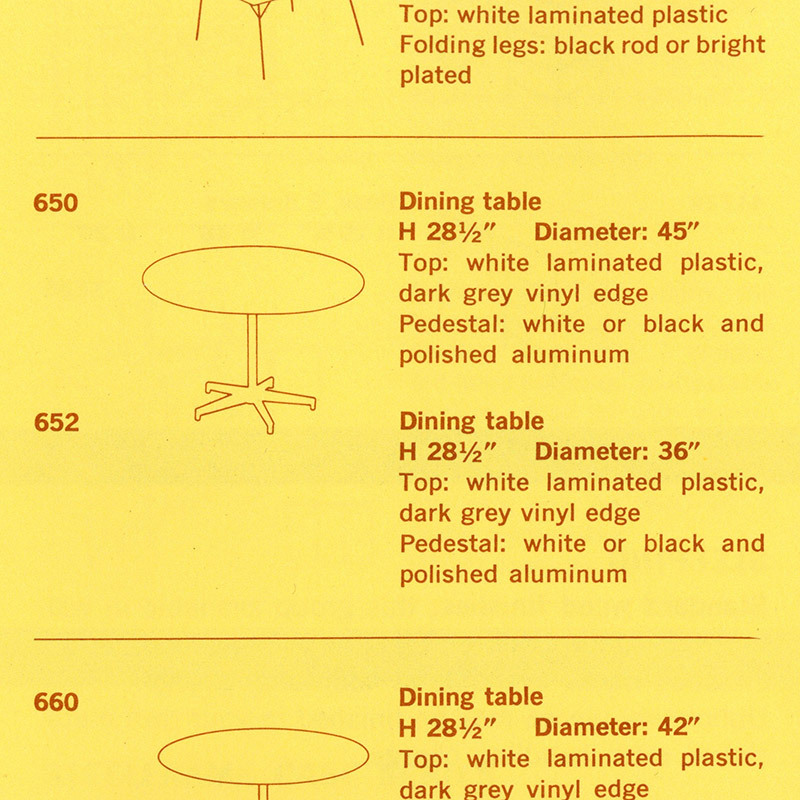 What are the original specifications of the Eames Model 650 Table? Is my Eames Model 650 Dining Table authentic? What makes it valuable? 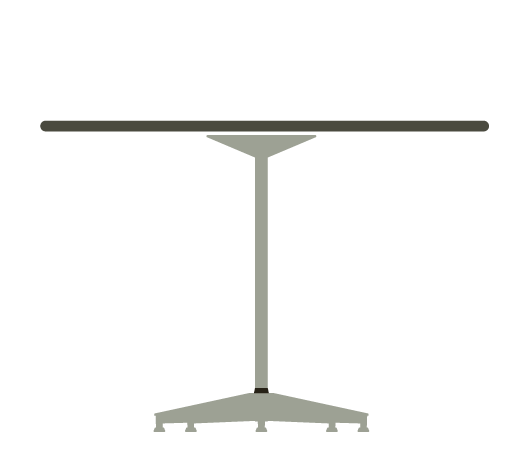 The Eames model 650 Dining table should have an original Herman Miller label attached, usually to the underside of the top. Labels always represent the best way of ensuring authentication. 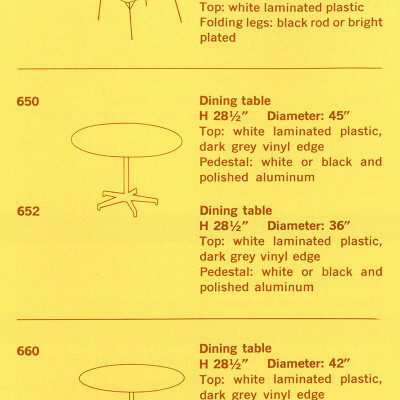 There are no known reproductions of the 650 table series giving a good default to the table being authentic. 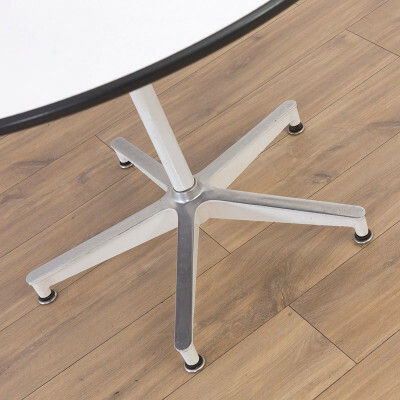 Production of the 650 tables was relatively short and there are not great numbers in the secondary market, especially compared to those with Contract and Universal Bases. 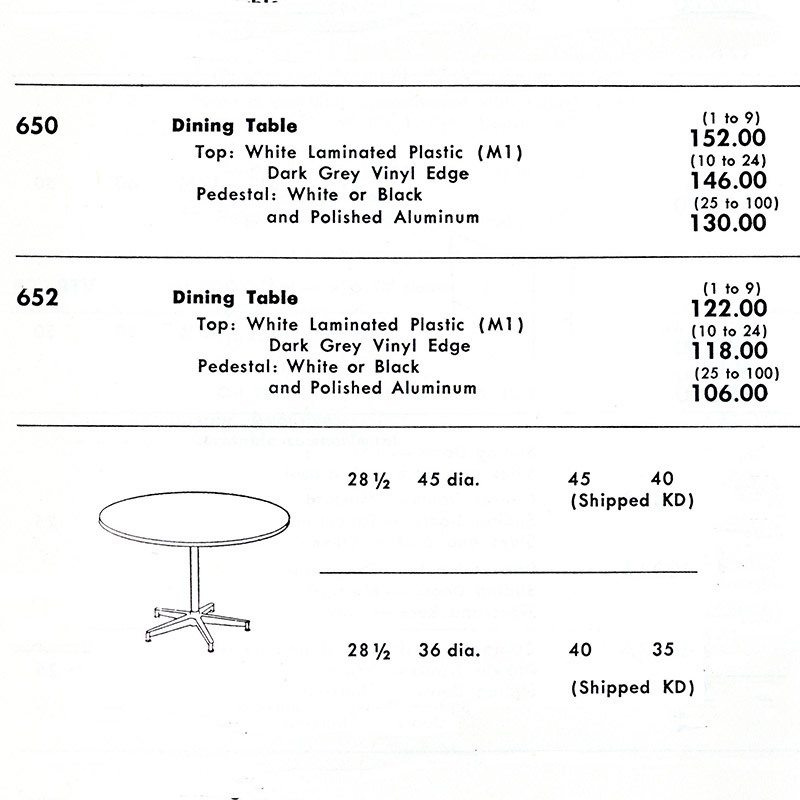 More of the white based variants of the 650 tables tend to appear in the marketplace thus generally showing they sold in greater number. 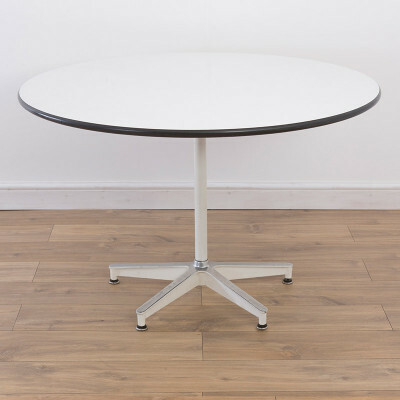 Condition is the driving factor behind the overall value of the 650 tables. The stem and base were painted and therefore chips in the paintwork can become unsightly over the years. But most important is the condition of the top with a good general surface always attaining a higher desirability. The dining table is found in two sizes with the larger of those the one most found within the marketplace. Size itself however won't generally drive the value as it is very much dependent on the needs of the buyer. The edging of the 650 tables was a very dark grey protective vinyl.